I put on the cloak… the hue fuligin, which is darker than black, admirably erases all folds, bunchings and gatherings so far as the eye is concerned, showing only a featureless dark. This is pretty cool stuff: what do you get when you take carbon nanotubes and align them into a material? 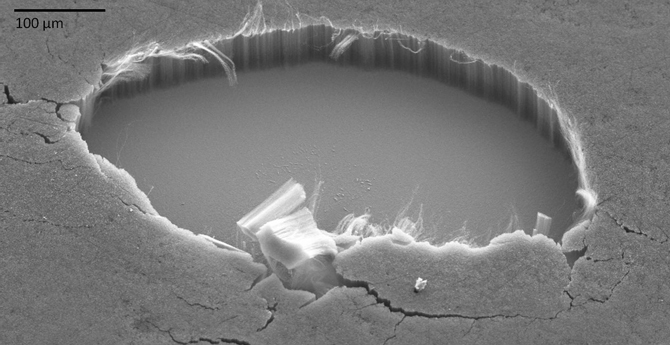 You get material that absorbs more than 99% of the visible light that falls on it. If I am reading this correctly: this stuff is going to look really black. If it absorbs light, it must therefore heat up, right? If it doesn’t transfer that heat by conduction or convection, it must radiate it, right? Likely what’s happening is that the energy trapped gets re-trapped when re-emitted, until such time as it emits on a wavelength the nanotubes don’t do well at trapping (and as long as that’s not a wavelength crucial to the immediate application – like the wavelengths being studied by a telescope upon which this coating is used) that’s fine. It just means that we can build telescopes that study more wavelengths at the same time. Of course, it’s also possible that the light-energy aren’t absorbed by the carbon atoms, but rather that the carbon tubes channel the energy like an antenna to the material which the nanotubes are coating. If the material re-emits the energy on the nanotube side. it gets channeled back to the titanium/ silicon/ whatever. If, however, it gets emitted from the other side of the coated material, then it doesn’t get channeled back and allows a safe/ free route for discharging excess energy and returning to thermodynamic equilibrium. That would be ideal, really, for space based telescopes since metals readily give up their excess energy and this would allow you to make sure it was re-radiated to the space outside the shade-tube of the telescope. Of course, I’m nothing like a physicist and don’t know anything about the route this particular material takes to re-establishing thermodynamic equilibrium, but it sure is fun to speculate. This stuff is cool! The difference between ordinary black at, say, 80% absorption, and blacker-than-black at 100%, is not that big. Radiation can’t heat an object to a higher temperature than the object emitting the radiation (or you’d easily use it to violate the Second Law of Thermodynamics). In an ordinary room, the blacker-than-black object will be at room temperature. The only difference is that it will attain its equilibrium temperature slightly faster than other objects. Sure, it will radiate, but, at room temperature, this radiation will be in the far, far infrared (just like every other object in the room, only slightly more efficient — most day-to-day non-metallic objects are already close to ideal black bodies in the far infrared). In sunlight in space it’s a bit more complicated, but my point is that, thermally, it won’t behave very differently from ordinary materials. There’s no one-way heat conduction, nanotubes or not (or, again, you could use it to violate the Second Law). 99%? Feh! I laugh at 99%. I need 70dB of blackness for my next project (99.97% if they’re talking about amplitude absorption). Fortunately that’s in the millimeter wave band, where you just mix small beads of steel into epoxy and there you are. As demonstrated by Ed Wollack, who the article says is looking at this new nanotube coating for use in the far IR. Which is a little confusing since far IR sort of overlaps with mm wave, depending on how you define them. Ah, press releases. Guess I’ll have to ask him myself. As for heating up, what cvoinescu said. The additional absorbtion won’t make much difference, and the re-emitted radiation will be close to a blackbody spectrum at the temperature of the absorber (much longer wavelengths). And (for a small digression) that is why spacecraft thermal engineers talk about materials having a separate absorbtance and emittance, even though the first law of thermodynamics says those are equal. What the thermal folks mean when they say “absorbtance” is “at the frequencies near the peak of sunlight”, and for emittance they mean “at the frequencies near the peak of a room temperature blackbody”. You can use the difference to adjust the temperature of your spacecraft. Sort of like how the Earth’s absorbtance (at 5500 K) is constant, but we’re changing the emittance (at 300 K) by adding more CO2 to our thermal blanket layer. What the thermal folks mean when they say “absorbtance” is “at the frequencies near the peak of sunlight”, and for emittance they mean “at the frequencies near the peak of a room temperature blackbody”. You can use the difference to adjust the temperature of your spacecraft. Sort of like how the Earth’s absorbtance (at 5500 K) is constant, but we’re changing the emittance (at 300 K) by adding more CO2 to our thermal blanket layer. That was such a good explanation, I understood it!! By the way, are such tiny fibers dangerous to humans? I’d imagine that breathing that stuff would not be a good idea, and that it’d be fine enough to just go right through skin. It’s only carbon, though, right? I used to work with carbon nanotubes ages ago in a diffferent application. If memory serves the jury is still out on nanoparticles as far as health and safety are concerned – the topic pops up in science periodicles every so often. The bottom line is, noone knows what will happen to these materials in the long term. With carbon nanotubes the risk was, I believe, that the body doesn’t actually have any way of dealing with them. The human body* usually tries to break down and / or excrete foreign substances, which probably won’t work too well with exotic materials that are famed for their resilience, insolubility or other unusual properties. So perhaps if you wear your fuligin coat long enough you’ll wind up with a (MK II) coal miner’s lung. Hazards of a modern society. *To name but one species potentially harmed. I’m guessing it’d be mighty expensive anyway. Funny you mention miners’ lung – when I asked that I was thinking of the bit on Mukerjee’s book on cancer (“The Emperor of Maladies”) where he talks about how there was a specific scrotum cancer that affected chimney sweeps – that was how victorian scientists started to realize there were carcinogens. Asbestos is only innocuous silicates too, chemically not very different from glass. It seems to be the shape and size that causes problems, so I wouldn’t be too surprised if carbon nanotubes turned out to cause mesothelioma too. So I guess carbon nanotubes are not the habitat for Maxwell’s demons. Sigh. By the way, Marcus, I believe you meant the shuttle Colombia, not Challenger. The latter was lost in 1986 due to the SRB O-ring seal failure. It was Columbia that broke up on reentry after the wing’s heat protection was holed by an ice impact during launch. I remember thinking at the time that NASA should never name another spacecraft with a word starting in “C”.